Most people today lead busy lives. For the convenience of our customers, we have created a couple of payment programs to take the hassle out of your winter fuel bills. SmartPay is our monthly payment program, which lets you spread out your fuel payments. 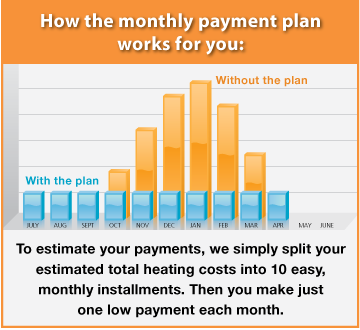 That way, your heating costs will always be manageable and predictable. You’ll have one set payment each month for most of the year. There is no cost to enroll. Many of our customers have already enrolled in this program. You don’t use more heating fuel. You don’t pay more per gallon. You pay only for the fuel you receive, and there’s no finance charge. If your actual fuel costs are a little higher or lower than we estimated, we can make adjustments as necessary during the course of the winter. Plus, if you have a service plan, we can spread that cost into SmartPay as well. To enroll in SmartPay, contact us so we can review your past fuel usage and calculate a monthly payment schedule for you. Remember, it does not cost you anything to enroll in SmartPay! In fact, you will earn a rebate each month that you have a credit balance on your account. Every year, more customers enroll in our Auto Pay program, which allows any billable service or fuel delivery to be paid automatically with their credit card or checking account. Poore’s customers tell us they love our Auto Pay program because it’s so simple. Auto Pay, which can be combined with e-bill (statements are sent via email), saves you hassle, can help you build points on your credit cards and makes it less likely you’ll inadvertently miss a bill in winter, which could create problems. To enroll in Auto Pay, call or email us. As a Poore’s customer, you pay our competitive daily rate, which moves up and down with the market. For heating oil customers, we give you the option of adding a price cap for extra protection against any significant price increase. no extra commitment or costs. Limits how much your price can rise, but not how far it can fall; if our retail price drops below the capped price, you pay whichever is lower. Each year, the capped price is determined by the retail market price at the time the plan is offered. There is a cost for this program because our suppliers charge us a premium for offering the “insurance” that allows us to keep your fuel price from skyrocketing, while also giving us the flexibility to lower your price should retail market prices fall. This program does not guarantee that you will always save money. It does, however, give you more stability and protection against price shocks. Contact us to learn more about price protection.